First for architecture, first for music festivals, first to make deep-dish pizza. However you look at it, Chicago is second to none! Now you can fly via Auckland to Chicago for a whole new chapter of USA adventures. With its bold architecture, massive lake, fantastic train system and diverse ethnic neighbourhoods, Chicago has been called 'the heart of America'. Not only is Chicago one of the most exciting cities in the USA, it's a launch point for other top destinations - New York, Boston, Washington, Toronto & Montreal, just to mention a few. Our flights to Chicago via Auckland depart three times a week. There are four seat choices - Economy, Economy Skycouch™, Premium Economy, and Business Premier™. If you're interested in cheap flights to Chicago via Auckland, we run regular special offers. You can sign up to receive early notice of our offers. To make the most of your time in Chicago, you'll need a well-considered plan. One approach is to theme each of your exploring days, so that you successfully cover off the things that make this city so captivating. Keep reading and you'll find Chicago's key themes - we've done the basic research for you. Chicago has been called 'the most beautiful city in the world', because its architecture is absolutely jaw-dropping. Not only are the individual buildings magnificent, they work together to create a cityscape that is greater than the sum total of its parts. 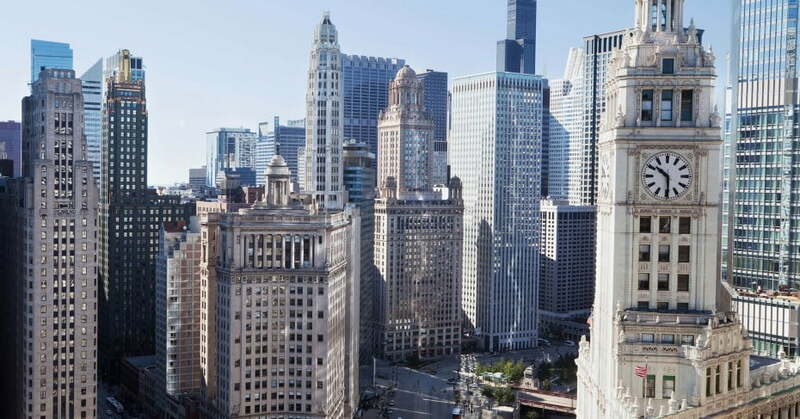 To give you an expert's understanding of the buildings, both old and new, the Chicago Architecture Foundation runs guided architectural tours of the city. 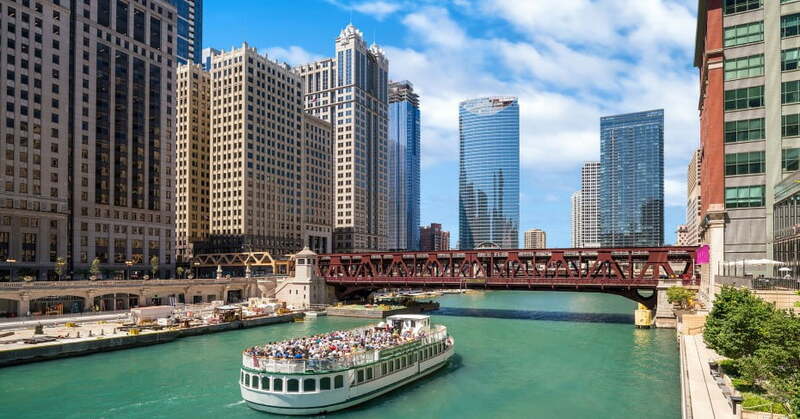 One of these tours, named in the Top 10 of USA tours, involves a 75-minute boat cruise along the Chicago River. Contemporary and historic structures to seek out during your Chicago explorations include Frank Lloyd Wright's Robie House, The Rookery, the 110-story Willis Tower (hard to miss! ), Pritzker Pavillion, Chicago Cultural Centre, Aqua Tower and Millennium Park. In Chicago, art is on the outside as much as it's on the inside. Huge public art installations are sprinkled throughout the CBD (known as The Loop), enabling a scavenger hunt of the artistic kind. You'll find The Picasso, a cubist masterpiece; The Four Seasons, a mosaic depicting the human life cycle; Agora, a big bunch of legs and feet; Monument with Standing Beast, which beckons you inside for a look; and the unforgettable Cloud Gate, a giant stainless steel bean-shaped sculpture. Continue your art day with the Art Institute of Chicago, which has a supreme collection of work by the Impressionists. This is your place for the Old Masters, as well as an entire room of Monet paintings. For a modern perspective, head for the Museum of Contemporary Art. You'll find the full spectrum of media here - installations, moving image and sound, painting, performance, photography and sculpture. This museum has no permanent collection galleries, so check the exhibition calendar to see what's on. The people who made Chicago great came from a multitude of cultures and countries. For support and comfort as they built new lives, they claimed neighbourhoods of the city as their own. Today these areas retain their distinct ethnic differences, which makes a tour of the inner-city suburbs fantastically rewarding for travellers. Lincoln Square is where German immigrants settled down. Pilsen is Spanish. West Town is Polish. La Villita is Latino. The rest are pretty obvious - Greek Town, Chinatown and Little Italy. Visiting these places is like taking a holiday within your holiday - you get to shop, eat and people-watch like you're almost in another country. Another neighbourhood you can't miss is 'The Magnificent Mile', where 460 retailers promise one of the best shopping experiences on the planet. Department stores are a Chicago specialty - Nordstrom, TJ Maxx and Macy's are dying to meet you. The most famous Chicago food experience is, arguably, the hot dog. The 'Chicago-style' hot dog was apparently invented by two European immigrants at the Chicago World's Fair and Columbian Exhibition in 1893. It involves an all-beef frankfurter on a poppy seed bun, topped with yellow mustard, chopped white onions, green sweet pickle relish, a spear of dill pickle, tomato slices, pickled sport peppers and a dash of celery salt. Chicago is also loved for its pizza - the deep-dish stuffed-crust variety, which pairs perfectly with local craft beer. Chicago brewers know their stuff, so you can look forward to a mighty choice of IPAs, sour ales, stouts and lagers. At the opposite end of the spectrum, Chicago restaurants can woo you with the most delicious fine dining. Have you ever eaten squab or Kobe beef? Peekytoe crab? Royal king mushrooms? Duck ham? Confit bass? Culinary creativity thrives in the best restaurants in Chicago, which draw ingredients and inspiration from north, south, east and west. After dinner, it's time to catch a show. Chicago has become the place to launch big-budget Broadway shows before they open in New York, so you're often getting the jump on new productions before they hit the Big Apple. In summer Chicago rolls out the good times with a music festival for every genre, although jazz and blues are the mainstays. The Chicago Blues Festival, Lollapalooza, Pitchfork and Chicago Open Air are very good reasons to book your holiday for June, July or August. From a sports point of view, baseball and NFL football are the games to catch. In spring and summer head for Wrigley Field, home of the Chicago Cubs baseball team for more than 100 years. Their number one rivals are the White Sox, so try to catch a Cubs vs Sox game. It'll be huge. In autumn, the NFL season kicks off at Soldier Field next to Lake Michigan. This venue is the home of the Chicago Bears, who have a long-standing rivalry with the Green Bay Packers. To experience the ruthless passion of live American football, time your Chicago holiday for the cooler months - September to December. Let's get one thing straight. Chicago isn't particularly windy. The 'Windy City' nickname stems from Chicago politicians of the 1800s who were famously full of hot air, particularly when it came to promoting their city to investors. Summer (June to August) is peak season in Chicago. It's when the festivals are on and the weather is hot. Chicago's temperatures can get into the 30s during July. If you want to avoid crowds, go for off-peak - April/May or September/October. Many travellers believe these months are the best time to visit, because the weather is comfortable and accommodation prices are lower. Winter is cold and breezy, but rug up well and you can enjoy ice skating, the ZooLights Festival at Lincoln Park Zoo and the Winter Wonderfest at Navy Pier. If you're travelling on a Australian passport you won't need a visa, but you will need an ESTA (Electronic System for Travel Authorisation). More about USA entry requirements.